This week we were able to provide an adoptive family with the finding ad for their daughter, adopted at 10 years old. The orphanage provided the family a xerox copy of her finding ad, published in 2010, which provided the earliest photo they had of their daughter, a smiling 5-year old. What the family didn't know was that the orphanage had published a different ad less than a month after their daughter was found. The orphanage had not provided this ad, which is typical. There are many reasons an orphanage might publish more than one finding ad -- to correct an ad with incorrect information, to change a finding location, to add a special need discovered after the first ad was published. Regardless of the reason, these earlier ad almost always have a different -- meaning younger -- photo of a child, and are thus extremely valuable (See the photo above as a typical example. 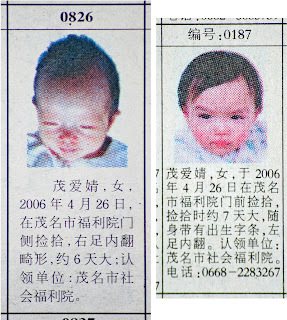 The first ad was published in 2006, a month after the girl was found. The second ad was published almost two years later). As we work on our orphanage data books, we are discovering more and ore of these duplicate finding ads. 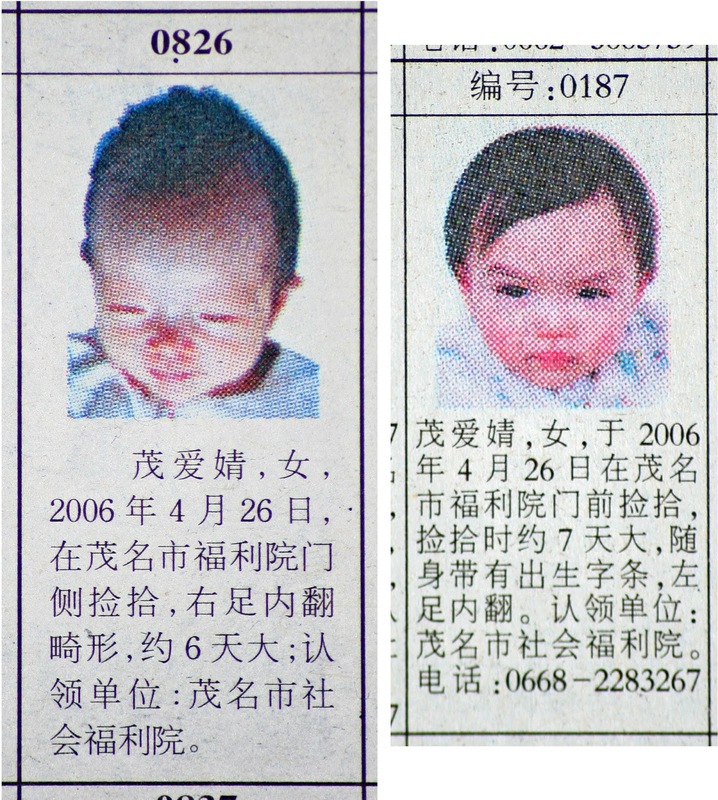 So, if you adopted your child later than average, or if you are simply curious to know if your child as two different finding ads, contact us and we will check our huge collection of newspapers. Who knows, perhaps the photo you thought was your child's youngest isn't the earliest after all.